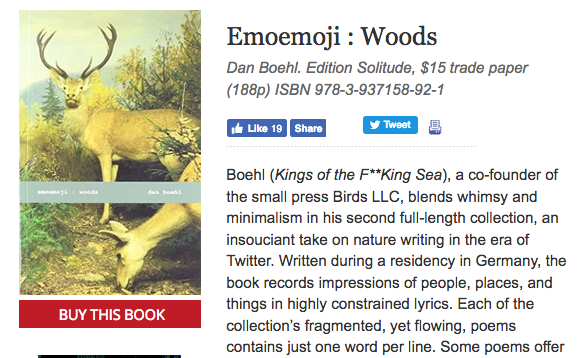 Check out the Publishers Weekly review of my new book, emoemoji : woods. My second book of poetry is now available for purchase from Small Press Distribution! Pick up your copy today! 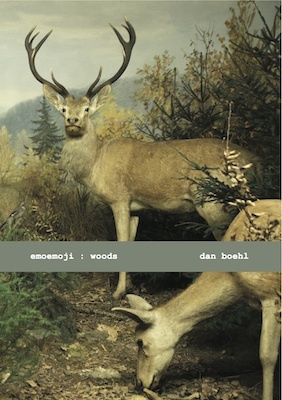 Thanks to Edition Solitude for putting out emoemoji : woods! During my 2015 residency at POGON in Zagreb, Croatia I had the opportunity to film some street videos and lay some real nice audio tracks over them to create these poetry videos. Maja Markovic made the animation and Boris Fisher recorded the audio. You can see all the videos grouped together up at Schloss-Post. Click this link to watch the videos on a YouTube playlist. 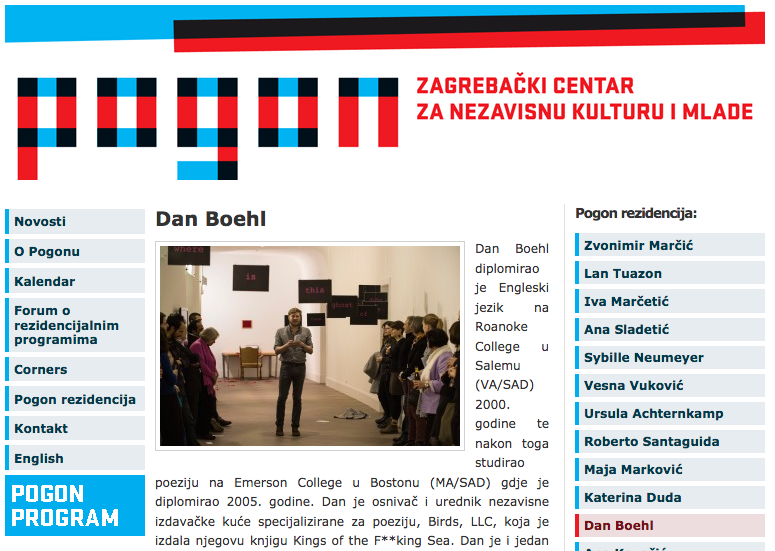 From January to March 2015, POGON – the Zagreb Centre for Independent Culture and Youth – awarded me a residency to live and work in Zagreb. Besides putting together a series of video works and an animation with artists Maja Markovic and Boris Fisher, POGON sponsored two big billboards of my poetry. 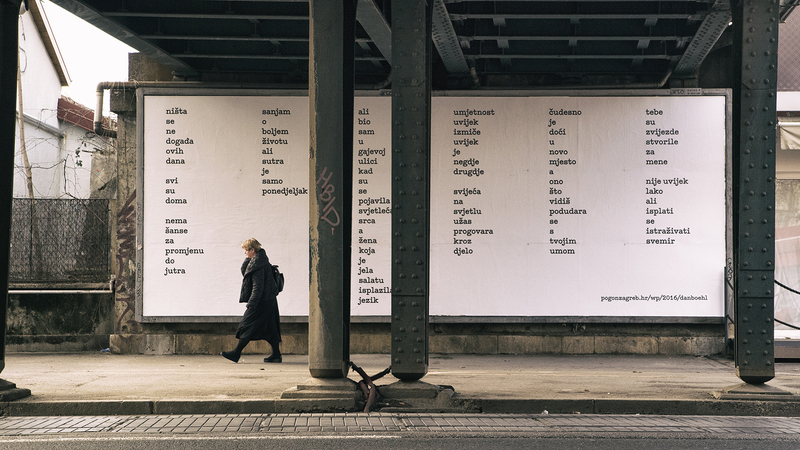 The Croatian language poetry billboards appeared under a tram bridge in the area around Zagreb University. 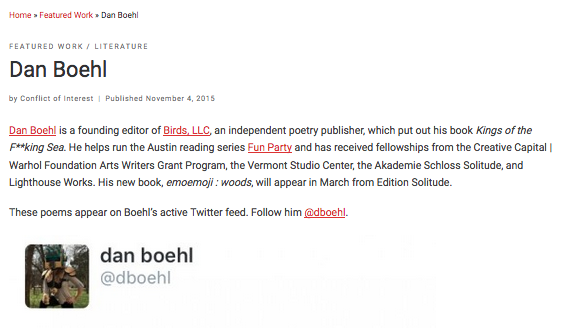 Conflict of Interest, an Austin-based arts magazine, featured some of images of my Twitter poems as their most recent “Featured Work.” Check it out! 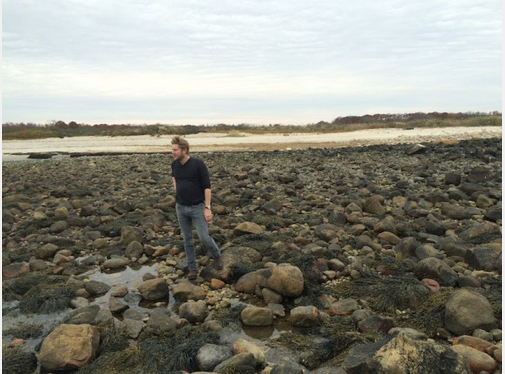 I wrote up a little report on my time living on Fishers Island for the Lighthouse Works Residency for six weeks. The island is only accessible by ferry. I stayed on the island 36 consecutive days as the population dwindled to off-season levels. Check out the full report over at Schloss-Post. 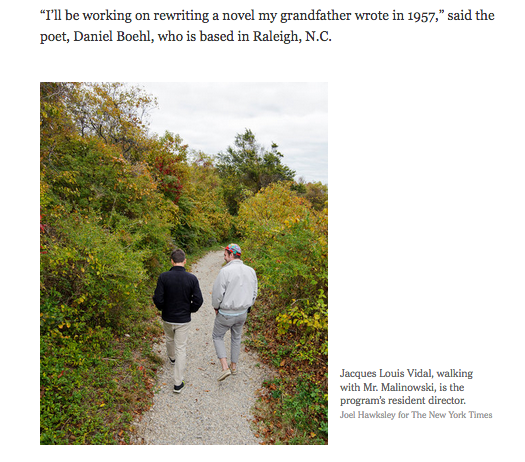 Check out this article in the New York Times about my residency on Fishers Island, New York at the Lighthouse Works. The residency brings artists to an ultra-exclusive island in Long Island Sound where the population swells from 5,000 over the summer down to just 200 residents in the off-season. No hotels, one restaurant, and a $50 bike tax to take a non-resident bike on the ferry from New London, CT to Fishers Island. 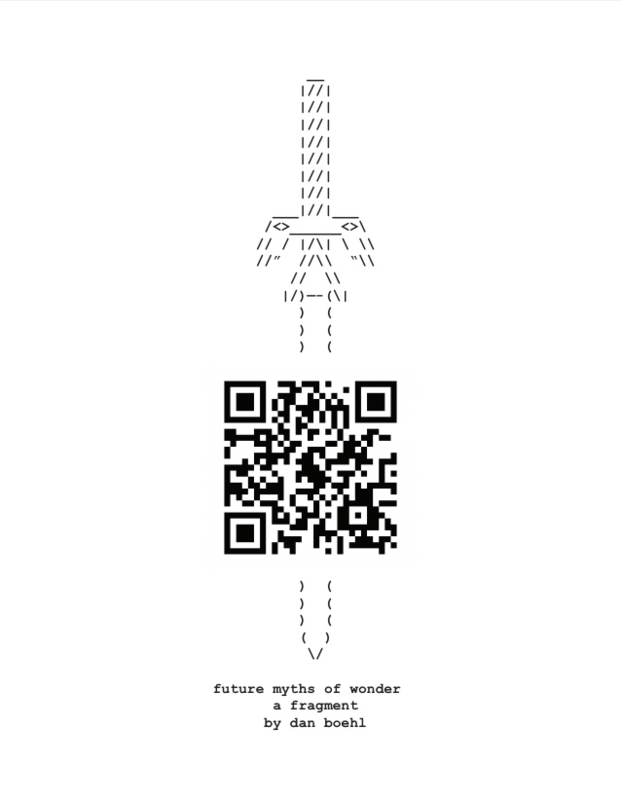 I have an interactive poetry practice. 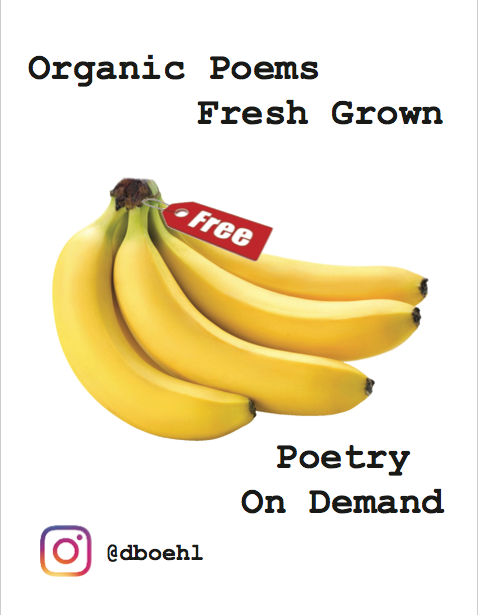 I like to talk to people and then write those people poems that contain the text from our conversations. This is a process I began at the Vermont Studio Center in 2013. I further developed this process at the Akademie Schloss Solitude in Stuttgart, Germany. 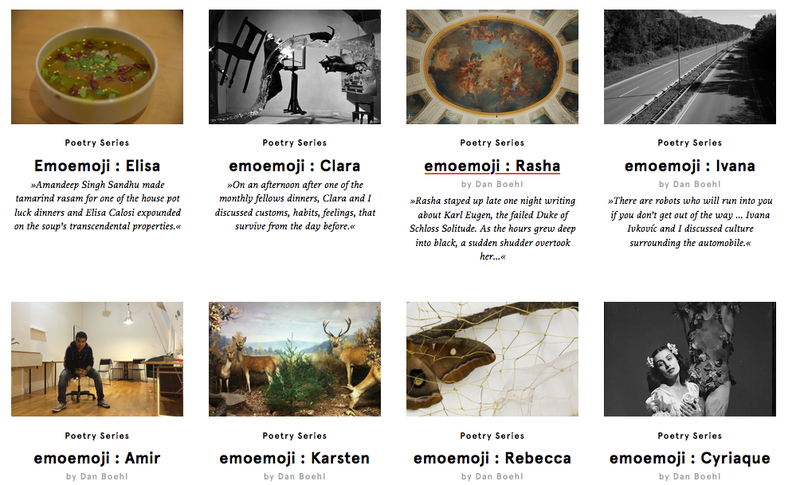 You can read a bunch of the emoemoji poems at Schloss-Post. 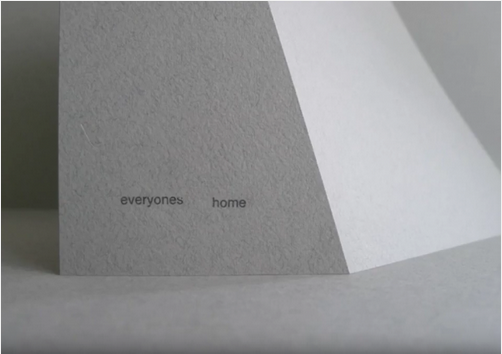 Each one was written for and is dedicated to a fellow resident of the Schloss Solitude.